In 1886 the Māori King Tāwhiao established a bank, Te Peeke o Aotearoa, which was in business until around 1905. It was set up to provide banking and monetary services to Māori and was also an expression of Māori autonomy. The bank produced banknotes, though none seem to have been officially issued. The few that survive are among the rarest notes in New Zealand. The surviving notes differ slightly and some have a truncated version of Tāwhiao's name – 'Tawhia' – in one corner. This £1 note is held by the Reserve Bank of New Zealand. Though much of the iconography is not distinctively Māori, the text is in Māori and the flax bush depicted at lower left is a plant much used by Māori. The note includes the legends 'Kotahi Pauna' (one pound), 'Ko Te Peeke o Aotearoa' (the bank of Aotearoa, or New Zealand) and 'E whaimana ana tenei moni ki nga tangata katoa' (this money is valid for all people). 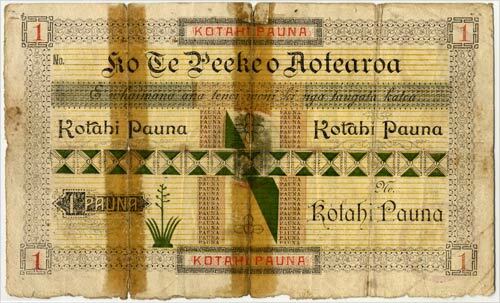 The words 'Pauna' and 'Kotahi' also make up the vertical and horizontal lines in the note's centre. It is not numbered so it was probably not used, though it is clearly well-worn.